Oh if walls could talk. 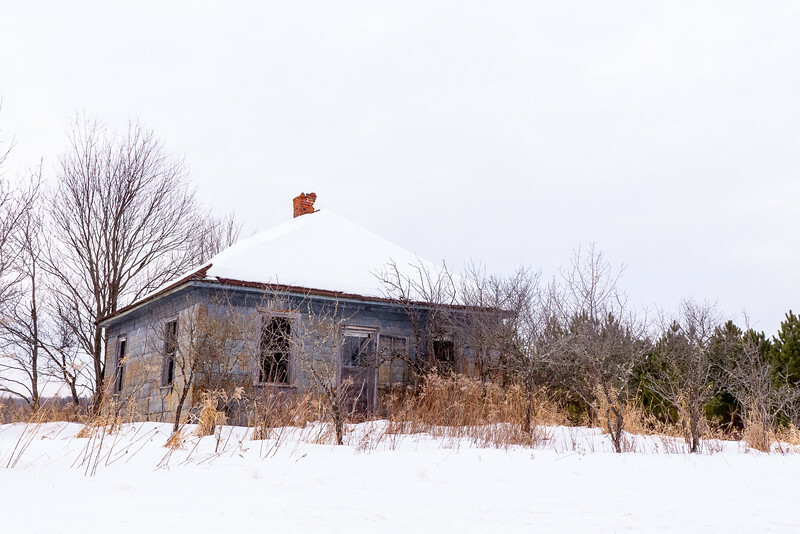 So many questions go through my head when I photograph abandoned houses. Who first built them? Who lived in them? What did they do? Were they happy? Sad? Was there drama? Why did they walk away? Was there a tragedy? I’ve always had an idea in the back of my mind to collaborate with a writer who could work with my photos and create a context for them. A story. Sure I can imagine, but I’m no storyteller. Just look at this next one. I found it on a main road in one of the segments of the Chequamegon-Nicolet National Forest. It’s a single story cabin with chinked-log construction. I can’t tell if it was ever wired for electricity. The ladder knocked me out and I so wanted to trespass, but I didn’t. 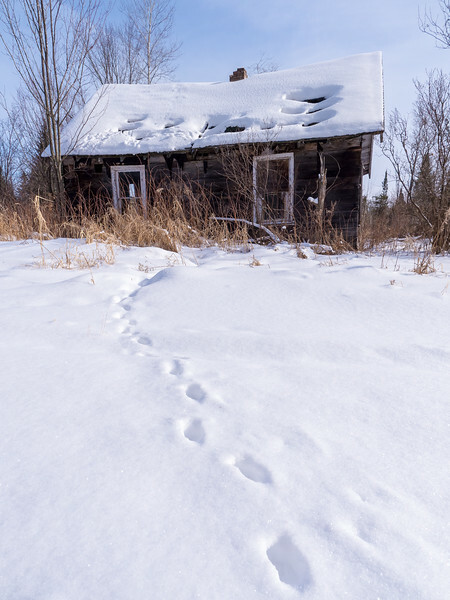 Did a trapper live here? A logger? A recluse? A mad bomber? Even today this is a pretty remote location despite the two lane road going right by it. 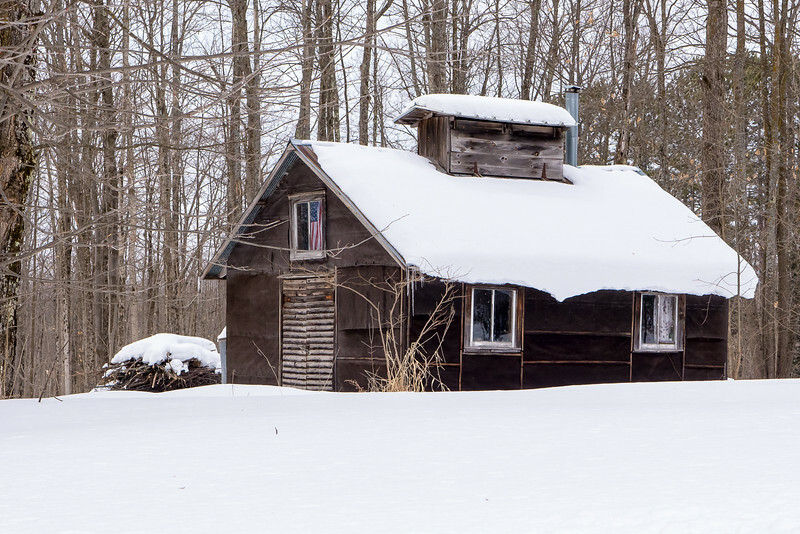 Not everything might be actually abandoned, like this next little cabin. I think it’s something used seasonally, maybe just for hunting. When I found it it was snowbound and pretty lonely looking. It reminds me of a tiny maple-sugar house with that little bit there on the roof. I love the flag in the window (which still has glass in it like the others you can see). This next one made me turn around, go back and put on my gaiters so I could wade through the snow. The critter tracks are a bonus. I love the holes in the sagging roof; something difficult to show without snow. Again, I wondered if this was a primary residence or just a hunting cabin or something. 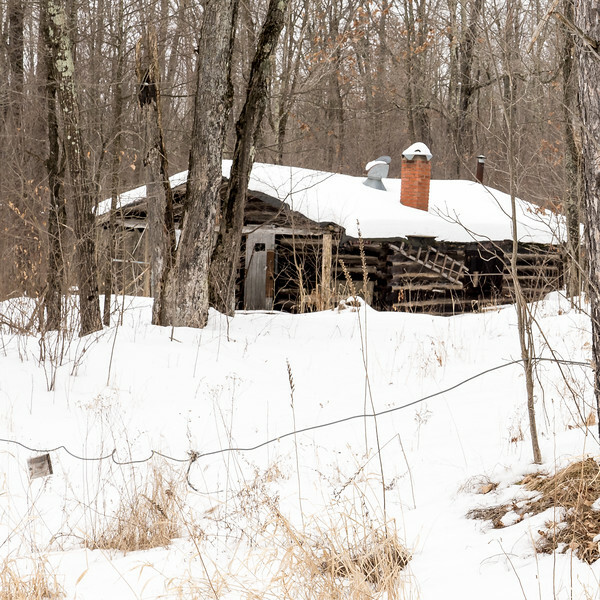 Like another cabin that I’ll feature in a post all its own, this little shack wasn’t face on to the main road, but turned sideways as if offering the cold shoulder to the world. I think this last one might have been a carriage house or garage. At first I thought school or meeting house, but those doors would be really strange for either of those and given that the doors don’t seem to slide open large enough for vehicles, I don’t know what it is/was. It’s all alone on the corner of two back roads and is sheltered by this L-shaped line of pine trees. The old roof and the new roof are a bit of a conundrum. Did someone start to restore it? Do they use it in good weather? It was all snowed in so it’s obviously not in use during the winter. I love the symmetry of it. I will be posting a few more pieces with abandoned places and things, but spring fever has caught me. I’m a bit weary of the monochrome world out there and I’m dying for some greenery. It won’t happen for weeks though and so I will try to get out and enjoy the season as it is. Stay tuned for longer post about one particular little lost cabin. This time I went inside! I’m fascinated with old, seemingly abandoned places too and can never resist the opportunity to photograph them. One such photo hung in the DeCordova Museum for awhile. I wonder if a local historical society would know the history of that building in your last image? Thanks Pat. I think abandoned places hold a powerful allure for almost everyone. They’re mysterious and will probably remain so for anyone who comes across them. 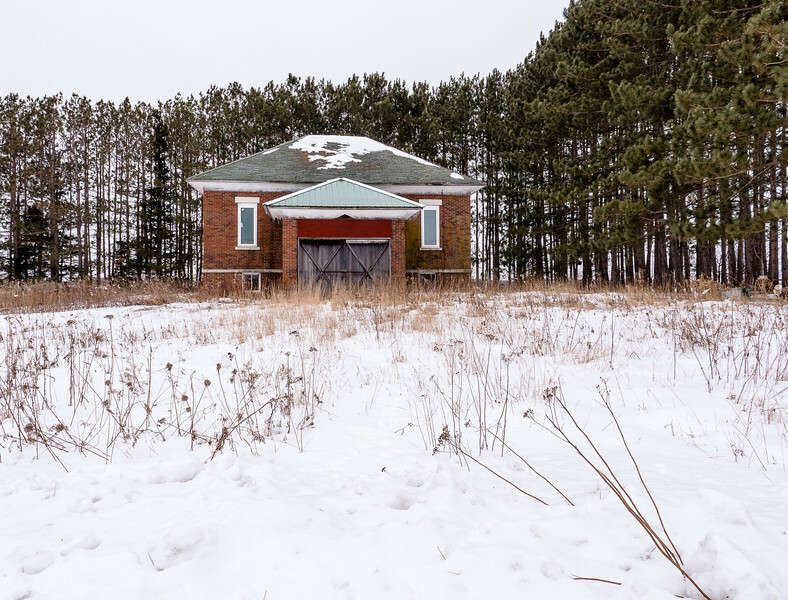 Up here in Northern Wisconsin there are tons of property just left to sit. I haven’t looked into historical societies yet. As most of the towns up this way are unincorporated, I’m not sure how many there actually are.